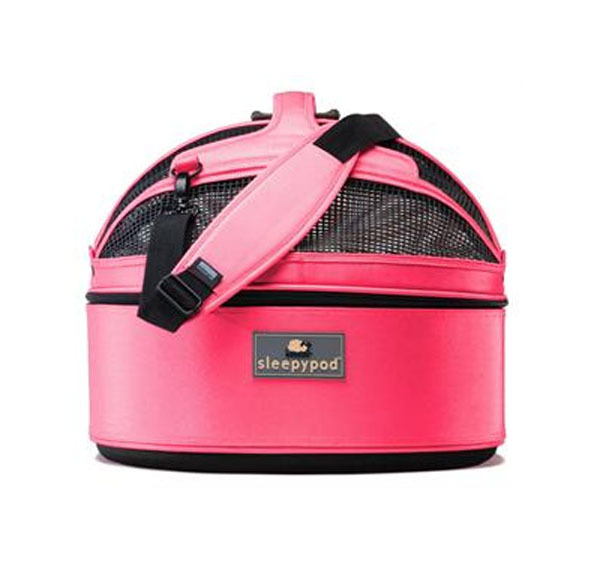 A Sleepypod carrier is more that just a pet bed, carrier or car seat. It is a round shaped luxurious space designed to give your special pet a space to cuddle and be secure. The inside is designed for your pet's individual needs. It comes in 6 colors: Jet Black, Dark Chocolate, Blossom Pink, Strawberry Red, Sky Blue and Arctic White. Mesh dome top with carrying handle. It is contoured to fit pets to 12.5 lbs. Jet Black, Dark Chocolate, Blossom Pink, Strawberry Red, Sky Blue and Arctic White. Finally, it has a liner that is washable. Ultra Plus bedding with water resistant foam.